"A hearty beef and vegetable stew with a little spice that is quick to prepare. You can cook the whole thing in one hour, or let it simmer in the slow cooker all day." In a large skillet over medium-high heat, cook ground beef until evenly browned, stirring frequently to crumble. Drain grease, and transfer to a soup pot. 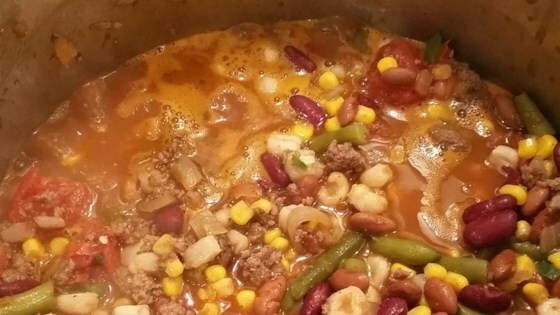 Pour in the hominy, stewed tomatoes, corn, kidney beans, ranch-style beans, and add the onion and green chilies. Cover, and cook over medium heat for 1 hour. i followed the recipe with the exception of adding minced garlic and jalapenos. 5 kids loved it!! they put shredded cheese on top. I loved it without! low cal too!! thanks for sharing! This recipe is so good...perfect as written. It was even better the next day.